West Windsor, N.J. – What does it take to adapt an acclaimed and complex Latin American novel for the stage? 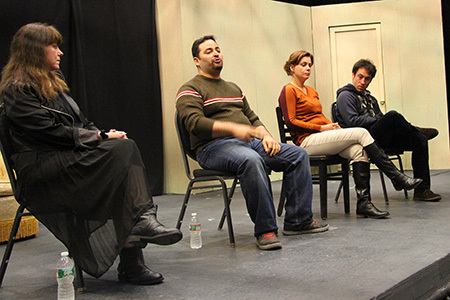 MCCC students got a glimpse of that process during a special presentation by four members of Repertorio Español, New York City's premier Spanish language theater company, who traveled to Mercer’s Studio Theatre on Nov. 7. The presentation began with two actors performing pivotal scenes in Spanish from the play, “El Amor En El Tiempo De Cólera,” (“Love in the Time of Cholera” by Gabriel García Márquez). In one scene they play carefree, young lovers, while in another, they are depicted some five decades later after the female character’s husband has died. Following the scenes, the company’s resident director, José Zayas, the two actors, Luis Carlos de la Lombana and Zulema Clares, and playwright Caridad Svich sat on stage and participated in a lively discussion of the mission of Repertorio Español and their roles in the company. 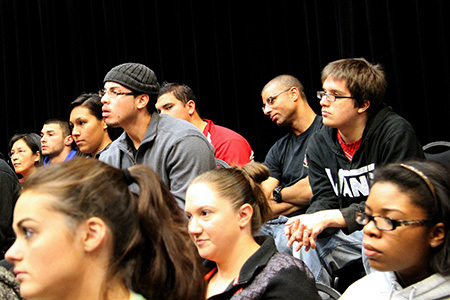 They also fielded questions from members of the audience, with several MCCC students posing their questions in Spanish. Topics ranged from the depiction of the characters in the play to curiosity about the backgrounds and processes of these accomplished theater people. Students expressed interest in keeping the connection alive by traveling into Manhattan to attend future performances at the company’s home base on East 27th Street in Manhattan. D’Arpa emailed the group and was struck by the director’s quick and enthusiastic response. “I was delighted that this very accomplished and busy troupe accepted our invitation excitedly and with no reservation,” D’Arpa said. More than 80 MCCC students attended the program, including those studying Spanish, as well as Theatre and English literature students. Sociology students exploring the institutions of marriage and the labor force in traditional Hispanic society also came out. “They were especially interested in the themes of gender and power portrayed in this play,” D’Arpa said. He noted that faculty members Jody Person (Theatre) and Denise Ingram (Sociology) were both excited to have their students attend. “We all saw it as an opportunity for interdisciplinary studies that would allow students to make connections between language, society and art,” D’Arpa said. 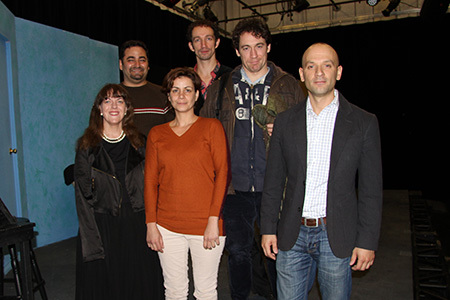 According to D’Arpa, the Repertorio Español theater members seemed right at home at Mercer. "That’s because all of them are also academics at heart," he said, noting that the director, José Zayas, graduated from Harvard and Carnegie Mellon and has produced plays in several countries. One of the actors has studied and taught acting and directing at the university in Cuba, and the other has two degrees from Spain, one in law and the other in theater. The writer, Caridad Svich, is included in the Oxford Encyclopedia of Latino Literature. Repertorio Español celebrates its 46th anniversary this year. Serving New York’s Hispanic community, the company has traditionally presented classic literature in Spanish and more recently has broadened to major contemporary works from Latin American and Spain. The theater presents as many as 20 shows per year, featuring up to 75 actors. More about the company is available here. Repertorio Español panelists, from left, playwright Caridad Svich, resident director José Zayas, and actors Zulema Clares and Luis Carlos de la Lombana. Actors Luis Carlos de la Lombana and Zulema Clares act a scene from “El Amor En El Tiempo De Cólera,” (“Love in the Time of Cholera”). Students were mesmerized as they watched the actors perform their scenes. MCCC World Language Coordinator Daniel D'Arpa, front right, invited the Repetorio group to campus. Also promoting the event to students was Theatre/Dance Program Coordinator Jody Person.